Venturing out into yet another franchise, Telltale Games presents Guardians of the Galaxy: The Telltale Series with its first episode, “Tangled Up in Blue,” a point-and-click adventure, situated after the events of the first Guardians of the Galaxy movie. We encounter the familiar cast of Chris Pratt — sorry, Star-Lord — Gamora, Drax the Destroyer, Rocket, and Groot, who have banded together to guard the galaxy against the villain Thanos. You fight alongside the Guardians as Star-Lord, or Peter Quill. As you play, you are prompted to press buttons to make your character move, fight, or dodge attacks. You also choose from dialogue response options which are recorded and influence the storyline even beyond the current episode. The basic spoiler-free gist is that our heroes answer a distress call by the Nova Corps, a galactic police force, who are being attacked by Thanos. The ensuing epic battle triggers dialogue options which affect the relationship between the members of the group. Within the changing group dynamic, Star-Lord comes to obtain a very powerful and very sought-after artifact, the Eternity Forge, which appears to make its owner’s dreams come true. Needless to say, the Eternity Forge becomes the source of another major conflict in the episode. The storytelling is well-crafted, with fast-paced action, snappy exchanges, conflict, and mercurial personal relationships. The dialogue presents options to influence the plot like deciding under what conditions to agree to answer a distress call. This interactivity feels more involving than simply watching the plot of a movie unfold on screen. The opportunities to explore the surroundings, and investigate objects to find a solution to a puzzling situation (like extracting a chip from a dead soldier’s helmet to unlock a panel), create suspense. However, sometimes the task consisted in simply obeying what the screen tells you to do, such as “press ‘Q’ to hit Thanos,” or, “press ‘W’ to walk Star-Lord through a hallway.” It felt a bit too simplistic. Also, occasionally, different decisions lead to the same outcomes. I felt gaslit. Apparently, the story seems to hinge on only a few critical choices. There are a handful of those, and only at those points does one trigger substantially different outcomes for characters who develop in accordance with how the plot moves forward. 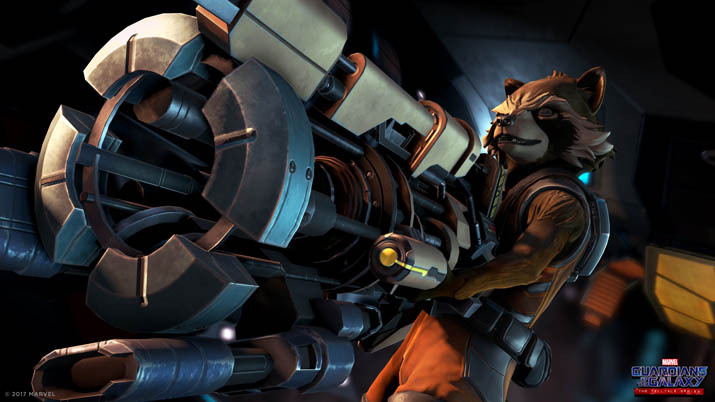 The voice acting is solid with truly outstanding performances by Brandon Paul Eells as Drax the Destroyer and Nolan North as Rocket. In general, I found the ambient sounds lacking. Outside of pivotal scenes, like the battle with Thanos, the sound effect work seems completely absent. The characters don’t make noise when they walk or move, and background characters in a bar, for example, can be seen talking, but can’t be heard. That creates the impression that the beautifully animated environments are barren. What it lacks in ambient sound the series tries to make up with the soundtrack. Old school rock songs like It’s a Living Thing and Why Can’t I Touch It?, by the Buzzcocks, underline the action and are essential to the franchise. The graphics in Guardians of the Galaxy are fundamentally different from the comic cel shading style familiar from the prior Telltale game titles. The animations are smooth, and the facial expressions fit the conveyed emotions. The only time I was put off a bit was when in a close-up Rocket’s facial hair seemed like a clump of putty — which made it difficult to suspend disbelief. 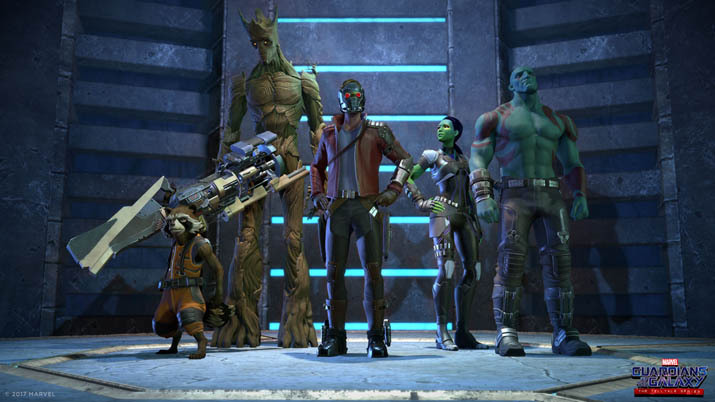 Guardians of the Galaxy: The Telltale Series’ first episode is a point-and-click adventure for everyone. Minor issues include missing sound effects and many arbitrary decisions that don’t move the plot. However, the plot of the first episode manages to pull the player in by requiring tough decisions about the future of the crew. As the other characters react to the player, you begin to identify with the main character, Peter Quill, and feel responsible for the choices he makes. The excellent graphics, the skilled voice acting, and the soundtrack leave you humming at the end while you check the planned release date for the second episode. Enzo is a writer of Italian descent. He has lived in Germany, Switzerland, and recently settled in New York City where he works as a freelancer. When he is not exploring the city or losing at Street Fighter 5 tournaments, he likes to play role-playing and strategy video games. You can check out his work at www.enzoscavone.com.